Rosie Scott of The New Craft House joins us today for a bit of a natter about first time nerves, a craft blog that turned unexpectedly into a business and running workshops at festivals this summer! Hi Rosie! It's great to have you on the blog. Want to introduce yourself to the Crafty Bs? Hi! I am Rosie, I’m 26, I live on a boat in London and I’m one half of The New Craft House. I run the business with my friend Hannah and we make craft kits and run craft workshops. 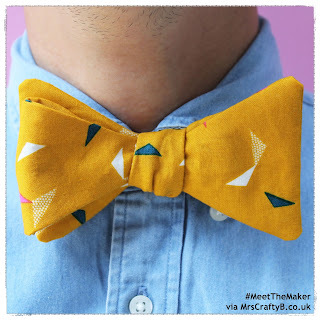 I made this bow tie using our newest kit, a Bow Tie Sewing Kit. It was one of the first proper samples of the kit we made and I loved how it turned out! The kit comes with everything you need to make the bow tie and there’s a choice of three prints, this one is called Flight. It is so bright and fun. I bet these kits are popular. Hubby B would probably love to sport this haha. When did you start sewing? When I was a child. My Mum was always sewing things and she taught me the basics. It was after University though when I really started to sew more regularly - I wanted to make all the clothes I couldn’t afford to buy! I love the freedom that sewing gives you over your personal style. How did your love for sewing transpire to a business? Me and Hannah set up our craft blog after leaving University with no ambition for it ever to become a business. After winning the Cosmopolitan Best Craft Blog award though we started being approached by brands who wanted to work with us. The business kind of grew organically from there and we now work full-time on it. Wow, how great for it to grow into a lifestyle for you guys. So great that you can do what you love full time as a career. Where do you take inspiration? I find inspiration in traditional crafts so places like the V&A and the William Morris Gallery are my go-to sources of inspiration. Beautiful prints, clothes and tapestries especially. Are you on any social media platforms? Great! So is this year your first at the Handmade Fair? Yep this is our first year! We’re feeling a bit nervous but everyone tells us that it’s their favourite fair so we’re sure it will be great. I've heard such great things Rosie. I am a first timer too and I can't wait. What are you most looking forward to? We like catching up with all the people in the craft community that we know. People who run businesses and will have stalls and also visitors and bloggers who have become our friends over the past few years. It is just going to be such a great atmosphere, I can tell. What will we find at your stall? We’re going to have a couple of show special offers on our kits as well as a giveaway! We will be at W40. Do you have anything going on in the run up to the fair? We’ve got a busy summer of running workshops at festivals. Bestival is the biggest - we’ll be there running tie dye workshops all weekend. Hopefully some time off to relax in the sun too! Oh my goodness, thats sounds amazing! Well I hope you have a great summer Rosie, Quick fire round before we finish? A cushion that my Grandmother embroidered with beetles and bugs. Wherever I’m travelling along the canal on my boat. Winning a business award from UCL. Fun, modern, inspiring, colourful, crafty. Thanks so much for sharing with us today Rosie and I will see you at The Handmade Fair in September along with lots of other Crafty Bs I am sure. I hope you manage to get a little break in beforehand!